What is the cabinet color? 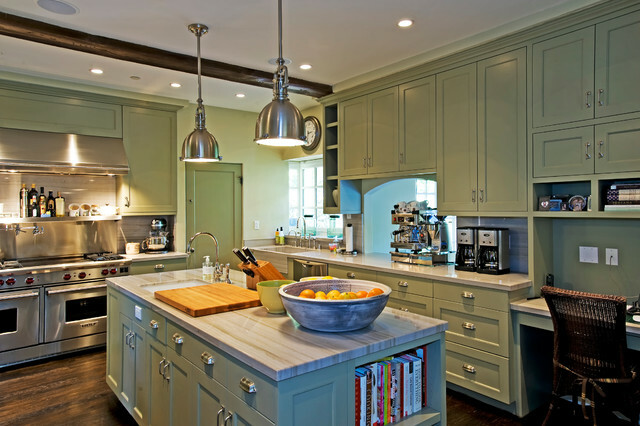 Could you tell me the exact paint color and brand of the sage green cabinets? Also, what back splash did you use? The cabinets were existing to the house so we don't know the brand. The paint is Benjamin Moore Silver Sage. The backsplash is the same as the countertop - white quartz. Could you tell me what the cabinet pulls are? Hi What are counters made of? What is the material (and colors of the stone) countertop? What is the name of the quartz that you used here? Did you have a matching slab of quartz made for the backsplash? floors - what kind of flooring did you use? These are the existing oak floors in the home. Wall color? - The paint color please? Hi! The green is Benjamin Moore Silver Sage. What is the source on the pendant lights? Thanks. Hi Connie! The pendants are from Visual Comfort. You can order them through our showroom.